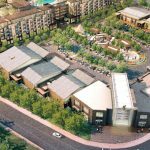 The Gateway Village project will develop a plan for a mixed-use residential and commercial development. The project is considered in the City’s General Plan, and would assist in accommodating future housing needs for planned growth. Planned growth would support new services, job generation, and decreased reliance on automobile trips. The proposed project would offer retail options near residential areas that would reduce vehicle miles traveled (VMT) and minimize trips. The project would also provide substantial landscaping, courtyards, a rooftop garden in the residential community, and a rooftop garden in the central plaza area. The central plaza area would also serve as a gathering space and would provide entertainment and recreational services. The project would provide an opportunity to revitalize an outdated shopping center and provide increased shopping and employment opportunities along a key commercial corridor that is convenient and accessible to the community. The project would infuse significant investment in the property through the site, building, and infrastructure improvements that would likely elevate property values of the nearby area. Overall, the proposed project would convert an existing commercial strip-mall type development into a mixed-use development that would enhance streetscape design and maximize in-fill redevelopment to improve the overall appeal of a major City thoroughfare. Accordingly, these efforts are in-line with the City’s vision for intensifying existing land development along El Camino Real. Circlepoint prepared a project-level EIR for the project. Key CEQA issues included aesthetics, school capacity, noise, and traffic. During community outreach, concerned was expressed regarding the number of traffic trips that would be going through adjacent neighborhoods, as well as congestion at local schools. Although these topics were adequately addressed in the EIR, Circlepoint worked collaboratively with the City and design team to research and develop measures that address these issues outside the parameters of CEQA. Measures were incorporated into the Conditions of Approval as well as discussed at the public hearings and in the staff report to ensure all concerns were properly addressed.